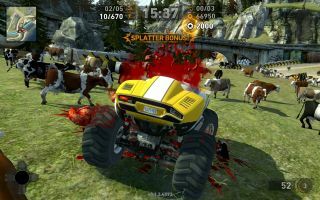 It's been almost three years since Carmageddon: Reincarnation earned $625,000 on Kickstarter, and well over a year since it went live on Steam Early Access. But now the bloody journey is almost over, as Stainless Games has announced that a full and final release will roll out in late April. The complete version of Carmageddon: Reincarnation will include a career mode with 16 chapters, each with three or four events—50 in total—as well as LAN and online multiplayer support for up to eight people at a time. There will be 24 vehicles (25 for Kickstarter backers, who get a special edition of the Red Eagle), nine maps, 36 race routes, more than 80 power-ups, and a half-dozen different event types: Classic Carmageddon, Car Crusher, Fox 'n' Hounds, Ped Chase, Death Race, and Checkpoint Stampede. "We're delighted to announce that the game will soon be going gold, and on April 23 it'll be showered in all its Steamy golden glory upon an eagerly waiting world!" the studio said in a statement. But the real reason we're gathered here today is the "launch announcement" trailer, because you just don't see trailers like this anymore. And probably for good reason, since I don't think anyone would argue that it's not monumentally, almost nobly, silly. But that's really what Carmageddon was, and clearly is, about: I played a lot of the original back in the day, and while I don't know if I ever won a race by crossing the finish line ahead of my competitors, I do recall screaming into a crowded stadium at about a million miles an hour and turning everyone on the field into a sticky, red mucilage. To paraphrase Samuel L. Jackson's brilliantly succinct assessment of Snakes on a Plane, you either want to play that, or you don't. If you do, April 23 is the day it happens. Until then, the Early Access version, which includes the Carmageddon Classic Collection, will remain for sale on Steam.